If drinking ice water to lose weight sounds too good to be true, it’s because it is. This rumor gained traction over a decade ago because of a study with surprising results. In 2003, a research team in Germany studied 14 people and found that if the participants drank ice cold water, they could boost their caloric expenditure by about 30 percent for over an hour. Meaning, “If you could chug your way through two liters of cold water, you could burn about an extra 100 calories per day,” Rachele Pojednic, Ph.D., assistant professor in the nutrition department at Simmons College and professor at the Harvard Extension School, tells SELF. “That’s a lot of freezing cold water to drink.” It is—about a large soda bottle’s worth—but an extra 100 calories per day is a pretty major deal for something that doesn’t require much effort. But the study raised other researchers’ suspicions. “Lots of researchers saw this study and said, ‘Wait, there have been other studies looking at the thermogenesis of food [how many calories it takes to metabolize the food, or in this case heat the water up to body temperature], and those studies didn’t show anything or just a tiny amount [of calorie burn]. '” The results didn’t make sense, so other studies tackled the subject and found that the 2003 study measured calorie expenditure in a flawed way. “When they redid these studies, they found there was a teeny tiny effect that wasn’t statistically significant,” says Pojednic. Your body does work to bring cold water up to its own internal temperature, resulting in a smidge of extra calorie burn. It makes sense when you think about it. “It’s a matter of physics—when you put an ice cube into a lukewarm drink, that drink uses energy to melt the ice cube,” says Pojednic. It’s the same thing in your body, but the amount is pretty negligible. “It’s very minimal, not enough to make a significant change in anybody’s weight,” Lauren Harris-Pincus, M.S., R.D.N., owner of Nutrition Starring You, tells SELF. Specifically, more scientifically sound research has found the thermogenic effect of drinking cold water is only about 4 to 7 calories per glass, or “equivalent to one plain M&M,” Pojednic says. Sure, if you’re trying to lose weight, every little bit of calorie burn helps. But this is in no way a magic weight-loss bullet. 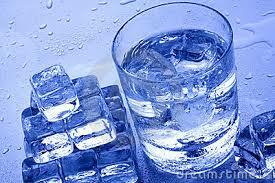 With that said, drinking cold water can help your weight-loss efforts in bigger, albeit more indirect, ways. Drinking enough water for your body’s needs is always smart, whether you want to lose weight or not. But if you are trying to lose weight, hydration is extra important. Proper water intake is key in making sure your metabolism is functioning at its highest ability, says Harris-Pincus. The fact that cold water is refreshing doesn’t hurt. “People don’t tend to drink enough water, and cold water is more pleasing to the palate, so it can make you more likely to drink it during exercise and during the day,” Harris-Pincus explains. Staying well-hydrated can also help you feel more energetic during your workouts, further adding to cold water’s potential to boost weight loss in a roundabout way. Plus, there’s the fact that drinking water—no matter its temperature—before you eat can fill you up a bit so you wind up taking in fewer calories. “You won’t get a huge calorie burn [from the water], but you could save hundreds of calories per meal,” just by preloading with H2O, says Pojednic. (Even better if you’re using that water to replace high-calorie beverages like soda or fancy coffee drinks.) What’s more, drinking water before you chow down can help you eat more mindfully because you won’t feel as hungry—and that’s a win-win, whether you’re hoping to lose weight or not.